Knowing how to keep climbers and wall shrubs in shape will prevent them becoming a bushy or straggly mess. Pruning at the right time of year will result in a good display the following flowering season. Such plants fall into RHS Pruning groups 11, 12 and 13. In general, plants that flower on the previous season’s growth are pruned immediately after flowering. These plants often flower in winter, spring or early summer. Plants that flower on the current season’s growth are often pruned in late winter or early spring. These plants usually flower in mid- to late summer, or in autumn. Some (such as Callistemon) require summer pruning after flowering. Training should take into account the natural growing habit of the shrub or climber, and its routine pruning requirements. Some wall shrubs (such as Pyracantha) lend themselves better to formal training in the manner of espaliers with rungs of horizontal branches. Most others are better suited to a less formal fan or hand shape. However it is not necessary to go for a formal look when training and pruning ornamental plants. Timing: Those that flower on the previous year's growth should be pruned after flowering and where flowering occurs on the current year's growth prune in late winter or spring. Examples: Akebia, Eccremocarpus, honeysuckle (Lonicera), Parthenocissus, Trachelospermum, Vitis. Pruning: No regular pruning needed. However trimming may be required to keep them to the space available, removing as much from the longer shoots as necessary. Timing: Annually; after flowering for those that flower on the previous year's growth, or in late winter or early spring for those flowering on the current year's growth. Examples: Bougainvillea, Plumbago, Solanum crispum, Sollya heterophylla. Pruning: Shorten sideshoots to within three to four buds of the permanent framework of branches. This induces more compact growth and promotes the formation of flower buds in the shortened shoots. Overcrowded, diseased or damaged shoots can be removed at the same time. Pruning: Shorten sideshoots to within two to four buds of the permanent framework of branches. Remove shoots growing towards the wall. 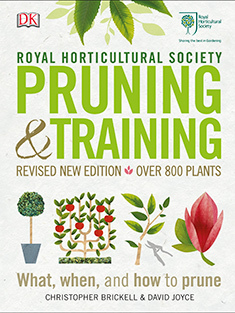 These pruning guidelines are suitable for established (at least 2 years old) climbers and wall shrubs. Newly planted and overgrown plants required a slightly different approach. Although many climbers and wall shrubs respond well to hard pruning and renovation, some (such as Ceanothus and Fremontodendron) are better replaced. Pruning at the wrong time of year may result in a poor display the following flowering season. Plants should recover and flower again fine in their second flowering season after pruning, so no long-term damage will have been done. Renovated plants that have been hard-pruned may take longer to re-start flowering. You may notice pest and disease problems while pruning. Aphids, scale insects and powdery mildew are all fairly common problems. Climbers and wall shrubs can also suffer from root diseases such as Phytophthora and honey fungus.